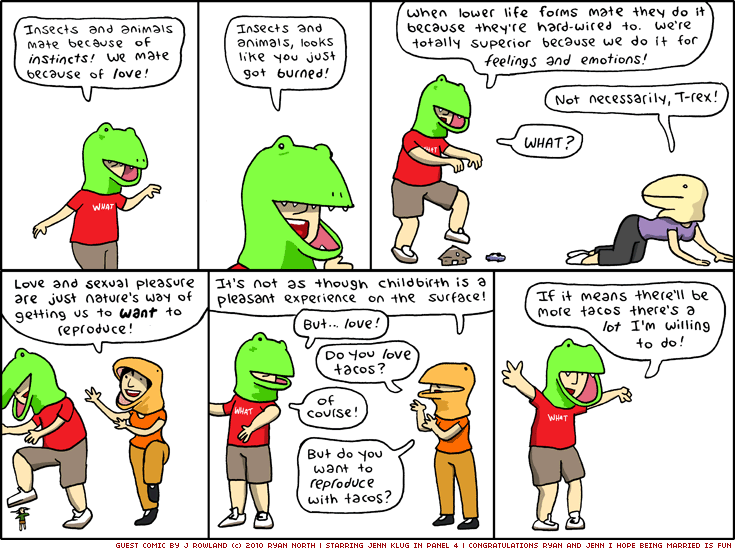 Dinosaur Comics - August 14th, 2010 - awesome fun times! HONEYMOON COMICS: jeff rowland of overcompensating! August 14th, 2010: Guys I totally got married last weekend (hooray! ), and some of my Comics Palz have done awesome strips for me! I get a week of WEDDED BLISS and you get a week of totally sweet comics. ACTUALLY, I get the wedded bliss AND the sweet comics, but you're still coming out of this in pretty good shape too. Enjoy!